Like it was yesterday, I remember walking into Tompkins’ Drugstore in the summer of 1964 and plunking down a quarter and a penny for a copy of FANTASTIC FOUR ANNUAL #2. (Just don’t ask me what I actually did yesterday, because I might not remember that.) I was a big fan of Marvel Comics in general and the Fantastic Four in particular, and had been ever since a couple of my girl cousins gave me a stack of comics they didn’t want the previous Christmas. FF ANNUAL #2 opened with a story called “The Origin of Doctor Doom”. Doom had appeared several times already in the FF’s regular title and was already the dominant villain in the Marvel universe. In twelve pages, Stan Lee and Jack Kirby filled in his back-story, giving him a layer of humanity he had lacked previously without making him any less evil or dangerous. It was a fine story featuring gypsies and witchcraft and super-science and a mysterious monastery in Tibet, along with cameo appearances by the college-age Reed Richards and Ben Grimm, the future Mr. Fantastic and The Thing. Practically every panel was etched into my eleven-year-old brain, and Lord help me, they still are. FANTASTIC FOUR: BOOKS OF DOOM, a trade paperback reprint of a recent mini-series, takes the information from that 44-year-old origin story (and a few later stories) and expands it into a large-scale retelling of how the young gypsy Victor von Doom wound up becoming the arch-villain Doctor Doom. The script by Ed Brubaker is well-written but doesn’t add much to the story, although he does throw in a fairly nice twist ending. The art by Pablo Raimondi is pretty good and his layouts are easier to follow than those of some modern comics artists, and it doesn’t appear to have any manga influence, always a plus for reactionary curmudgeons such as myself. The reprint is maybe a little misleading in its title, since the only members of the Fantastic Four to appear are Reed and Ben, making the same sort of cameos they did in the original origin story. Overall, I enjoyed revisiting this yarn, and I’m glad that Brubaker didn’t try to update it very much. BOOKS OF DOOM is worth reading if you’re a Fantastic Four fan. I love the old Ace Doubles. The Westerns and the science fiction doubles were fairly common in this area when I was a kid, and I read a bunch of them. But for some reason I never saw any of the mystery doubles until 1981, when I came across a couple of shelves of them in a junk store. Needless to say, I grabbed them all. There have been efforts to revive the Ace double novel format over the years, but the Hard Case Crime release of Robert Bloch’s SHOOTING STAR and SPIDERWEB may be the most successful yet. Of course, both of these novels were actually first published as Ace Doubles, although not back to back with each other. I’ve just read SHOOTING STAR, and I’ll get to SPIDERWEB fairly soon, I hope. 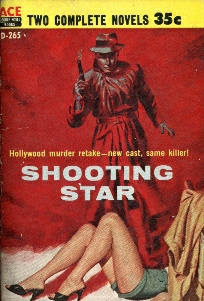 The narrator of SHOOTING STAR is Mark Clayburn, a Hollywood literary agent/private eye. I don’t think I’ve ever come across that particular combination before, and it makes Clayburn different from other private eyes who specialize in cases involving the movie industry, such as W.T. Ballard’s Bill Lennox and Robert Leslie Bellem’s Dan Turner. Bloch’s familiarity with th e pulp magazine markets gives this element of the novel a welcome touch of realism. There’s also a little tuckerizing going on, for example an undertaker named Hamilton Brackett. And the whole thing is told in an appealingly breezy, fast-moving style. Unfortunately the plot, which involves Clayburn trying to find out who murdered a cowboy movie star so that the producer who hires him can sell the dead star’s old movies to television (shades of Hopalong Cassidy), never develops into anything more than a very generic private eye plot. I kept waiting for Bloch to come up with a twist on a par with making his hero a literary agent as well as a detective, but that never happens. The writing is smooth and Mark Clayburn is a likable character, but the other characters never came alive for me. SHOOTING STAR isn’t a bad book, and I enjoyed reading it, but it’s certainly a minor entry among Bloch’s novels. I’ve never had much luck finding books at antique malls, although I always look every time I happen to find myself in one. Anything I find that I’m interested in is usually priced at least twice what I think it’s worth, and often three or four times what it’s worth. Today while running some other errands, we stopped at the local antique mall to look for a small desk for one of our daughters. We found one we liked pretty quickly but of course had to wander through the rest of the mall as well. I found a cabinet full of old sheet music and magazines and started pawing through it, not really expecting to find anything. Then, suddenly, on the spine of a magazine, I saw the magic word. Naturally, I pounced and started digging harder through all the stuff clogging the shelves. I was rewarded with not one but two issues of the pulp SPICY ADVENTURE STORIES, from November 1937 and April 1939. The ’37 issue is actually in very nice shape except the top two inches of the front cover is gone, telling me that it’s a copy that was stripped by the distributor ‘way back when. It includes at least two stories by Robert Leslie Bellem, one under his own name and one under the pseudonym Jerome Severs Perry, as well as stories by E. Hoffmann Price and Lew Merrill (Victor Rousseau). The issue from ’39 is also a stripped copy but is more beat up. The scan accompanying this post is from the Fictionmags Index, not the actual issue I found. Still, it appears to be complete and perfectly readable. Bellem is in this one, too, along with Lew Merrill. They were priced at a dollar each. I wish the whole cabinet had been full of them at that price. I’d have bought ’em all. As it is, I came home with these two and was very happy about it. I found some other good stuff, too, including several Whitman juvenile novels featuring Roy Rogers and Gene Autry. They were ridiculously overpriced, so they stayed right where they were and didn’t come home with me. I probably already read them when I was a kid, anyway. A few years ago I read a mystery novel by M.T. 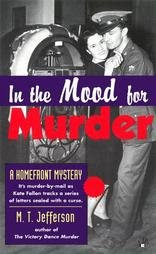 Jefferson called THE VICTORY DANCE MURDER, a “Homefront Mystery” set in a small town in Pennsylvania during World War II. It was a good, solid traditional mystery, not really a cozy but not hardboiled, either, and I enjoyed it quite a bit. It’s taken me a while to find the other two books in this short-lived series, but now I have, and I recently read the second one, IN THE MOOD FOR MURDER. As in the first book, the detective is Kate Fallon, a young woman who has gone to work as a riveter in the local defense plant. Kate’s fiancé and one of her brothers are overseas in the service, so naturally she wants to do her part for the war effort. This leads her to join the Molly Pitcher Society, a group of local women whose goal is to start a canteen for the servicemen stationed in the area. Unfortunately, things take a nasty turn when the members of the society begin receiving poison-pen letters threatening blackmail and worse. This is followed rapidly by a suspicious suicide and a couple of murders, and once again Kate finds herself helping the chief of police and the editor of the local newspaper ferret out the killer. It’s easy in a book like this for an author to go overboard on the setting, loading it down with too many details about the time period. Jefferson strikes just the right balance, avoiding anachronisms and making it seem like 1942 without beating the reader over the head with it. Likewise, the large cast of small-town characters, while a little stereotypical, comes alive in Jefferson’s hands so that the reader cares about what happens to them. That’s not too surprising when you realize that “M.T. Jefferson” is really H. Paul Jeffers, veteran author of numerous mystery novels, Westerns, true crime books, and assorted biographies and non-fiction. These Homefront Mysteries are probably the best things I’ve read by Jeffers, and I don’t hesitate to recommend them. One word of warning, though: if you’re going to read them, you’d better tackle them in order, because the prologue of this one completely gives away the plot of the first book in the series, including the killer’s identity. That’s something I think should be avoided if at all possible. I’m not really a fan of quirky little indie comedies. Philistine that I am, my tastes run more toward Will Ferrell movies. For example, I think that the post-credits epilogue in TALLEDEGA NIGHTS is one of the funniest things I’ve ever seen. So I’m really not the target audience for a movie like JUNO, which is about a sarcastic sixteen-year-old girl (Ellen Page) who gets pregnant and decides to give the baby up for adoption by a wealthy childless couple, played by Jennifer Garner and Jason Bateman. Wry, low-key humor ensues. JUNO is very well-acted and I laughed a few times. I liked it overall, despite the fact that it’s not the sort of movie I normally enjoy. In fact, I usually snooze right through ’em, but I didn’t with this one. I did doze off once, but only for a minute, and only because I wrote a lot yesterday and was tired, and of course because at my age dozing off in front of the TV is just one of the things you do. But if you’re thinking about watching JUNO I say give it a try. It’s okay. Alan Moore is an inconsistent comics writer as far as I’m concerned, but I really like a lot of his work. TOM STRONG falls into that category. I’ve recently read the first two collections from the comic book series written by Moore and drawn mostly by Chris Sprouse (with numerous guest artists). Book 1 reprints issues 1 – 7, Book 2 reprints issues 8 – 14, and in that run there’s a good mixture of continued stories, single-issue stories, and even some issues that feature two or three stand-alone stories. 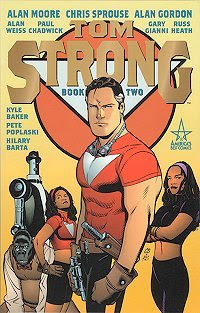 The character of Tom Strong owes a lot to both Doc Savage (raised from a baby by scientist parents to be a physical and mental marvel) and Tarzan (the family marooned on a jungle island, Tom befriending the natives who live there, and a longevity formula), with a little bit of Superman thrown in (Tom becoming the resident superhero of Millennium Ci ty). At the time of these stories, set around the year 2000, Tom Strong has been having adventures for nearly 80 years, although thanks to the longevity formula given to him by the natives on the island where he was raised, he looks less than half his real age. The same is true of his wife and apparently teenage daughter, both of whom are much older than they look. There are a few instances of post-modern irony in the stories, but it’s affectionate and for the most part they can be read as straight adventure yarns strongly influenced by both Marvel and DC at their Silver Age height. 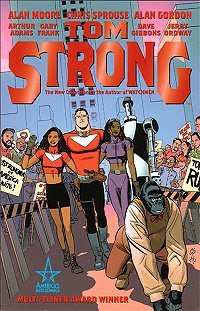 Tom Strong travels in time, visits alternate universes, deals with malevolent super-villains, and even encounters a funny animal version of himself. I thoroughly enjoyed both volumes that I read and will be on the lookout for more collections. If you grew up reading comics in the Sixties like I did, I think there’s a good chance you’d like them, too. Several people have recommended this book to me over the years, and rightly so. Ed Gorman’s Westerns are actually some of the best noir crime novels being published today. 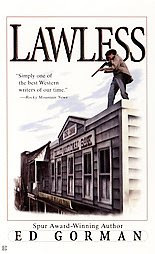 LAWLESS is no exception. The narrator, Sam Conagher, is a former outlaw who just wants to stay out of trouble. When he discovers that his old cellmate from Yuma Prison has gotten religion and even become a sheriff, he figures the town where his friend lives will be a good place for him to live an honest life. Sam gets a job, meets up with an old girlfriend, and seems ready to settle down . . . all of which should tip off the alert reader that things are about to go really bad. And so they do, as Sam gets involved in a particularly sordid criminal conspiracy and meets all sorts of people who aren’t really what they seem. As usual in a Gorman Western, there’s not even a hint of the mythological West here, just the real thing with all its warts, peopled with well-developed, fully human characters. The yarn spins out at a very fast pace, with things getting worse and worse for Sam until the reader begins to wonder not how he’s going to get out of trouble, but if . . . and if he’ll even survive. You can almost smell the sweat and desperation of a Fifties Gold Medal coming from this book, even though it was published by Berkley in 2000. You can’t get much better than that as far as I’m concerned. 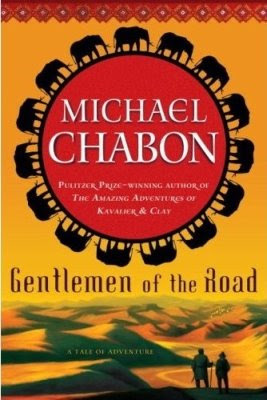 I was prepared to like GENTLEMEN OF THE ROAD for a couple of reasons: it looked like the sort of historical adventure novel that I usually enjoy, and I knew that author Michael Chabon has an appreciation of and fondness for genre fiction despite being known as a literary author. And with a couple of quibbles, I did like it, quite a bit. Despite the fact that he’s working with a historical setting here, rather than a fantasy one, what GENTLEMEN OF THE ROAD most resembles are the stories of Fafhrd and the Gray Mouser by Fritz Leiber. Zelikmann and Amram are a couple of traveling adventurers, mercenaries, and con artists. Zelikmann is an angst-ridden Frank with medical training (and in his description he bears a certain resemblance to Robert E. Howard’s Solomon Kane), while Amram is a massive Abyssinian who wields a Viking axe. They find themselves in the Caucasus Mountains near the Caspian Sea, in what would be modern-day Azerbaijan, helping a young nobleman who’s a fugitive from the usurper who murdered the rest of the young man’s family. But of course, not all is as it seems to be, and after a series of picaresque adventures, several massacres, an attempted coup, and encounters with assorted elephants, Zelikmann and Amram finally get everything straightened out satisfactorily. While I thought this novel was a lot of fun, a couple of things about it bothered me. Chabon’s colorful but long-winded style worked pretty well for the first seventy or eighty pages but began to get a little tiresome after that. If he had cut back on it and picked up the pace just a little, I think I would have enjoyed the book even more. The other thing is a curious lack of action. There are several big battles, but they occur off-screen with Zelikmann and Amram showing up after all the fighting is over. The few action scenes that actually take place are described in such a restrained manner that it’s hard to get excited about them. Maybe reading and rereading Howard for forty years has spoiled me, but in a story like this I want swords to flash, heads to roll, and blood to flow in rivers. But that’s just me, I suppose. Overall, GENTLEMEN OF THE ROAD is pretty entertaining, and if Chabon decides to write another novel with these characters, I wouldn’t hesitate to read it. Tonight we watched the latest made-for-TV Western on the Ion Network, LONE RIDER. Lou Diamond Phillips plays a former cavalryman who returns to his hometown to find that his childhood friend has married his old sweetheart and turned into the town tyrant, bent on controlling everything no matter who gets in his way. You know that sooner or later, there’s gonna be a showdown . . .
And so there is, although the movie pretty much takes forever to get there. Like ACES ‘N’ EIGHTS, the first entry in Ion’s Saturday Night Westerns series, there’s nothing in the script for this one that you couldn’t find in dozens, if not hundreds, of paperback Westerns published fifty years ago. There’s nothing really wrong with LONE RIDER. It’s well-acted, and the production values are okay. It’s just so relentlessly unoriginal. The DVD comes out next week, but I don’t really recommend it. Nearly fifty years ago I was a little kid running around listening to a transistor radio (you do remember transistor radios, don’t you? ), singing along with the hula-hoop song and the witch doctor song by Alvin and the Chipmunks. 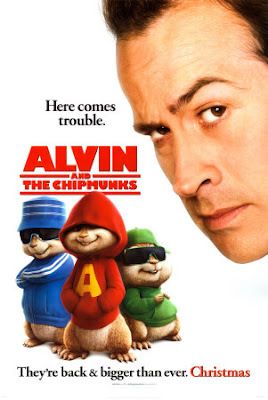 Tonight I watched a DVD of a movie with computer-generated versions of those same chipmunks singing rap versions of those songs and all I can say is . . . I feel old. Really old. Today I received a package of books from someone who signed himself simply “A. Reader”, with no return address except Fort Worth. A very nice note accompanied the books, saying that he just wanted to send them to me and would prefer to remain anonymous. A., if you’re out there, I want you to know that I appreciate the books very much, and thank you for thinking of us. Several years ago I read a bunch of pulp stories and novels by Donald Barr Chidsey. Chidsey was a regular in ARGOSY during the mid- to late-Thirties, contributing hardboiled crime stories (his series of linked novelettes about insurance investigator Nick Fisher and jewel thief Eddie Savoy is excellent), Musketeer-style swashbucklers, pirate yarns (some of which he expanded into paperback novels in the Fifties), and South Seas adventure yarns. He also wrote a long-running series in DETECTIVE FICTION WEEKLY about Miami cops Morton and MacGreevey. I haven’t sampled any of those yet, but I will sooner or later. After the decline and eventual demise of the pulps, Chidsey concentrated on big historical novels and works of historical non-fiction. EACH ONE WAS ALONE is an early Chidsey novel, from 1938, and while it’s set in the South Seas, it’s no adventure yarn. Rather, it’s a Grand Hotel-style soap opera, as a handful of tourists is stuck in a run-down hotel on an isolated island waiting for the arrival of a French steamer that’s been idled by a shipping strike. Naturally, all sorts of melodramatic complications ensue, most of them involving lust, greed, murder, and robbery. Chidsey provides back-stories for all the passengers and the islanders with whom they interact. It’s all told in slick, well-paced prose, but as far as I’m concerned this is one of Chidsey’s rare misfires. All the characters are fairly unpleasant, and I never really cared much about them. He does a fine job with the tropical atmosphere, though. You may have noticed that I’ve been reading quite a bit of South Seas stuff lately. There’s a reason for that, and I’ll elaborate on it when I can. In the meantime, while EACH ONE WAS ALONE isn’t a terrible book, I don’t really recommend it, either. There are plenty of Donald Barr Chidsey novels that are better. 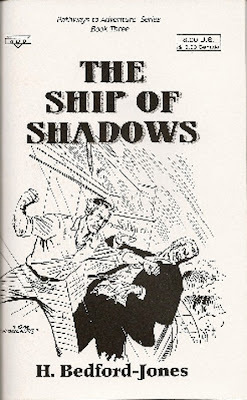 THE SHIP OF SHADOWS is another Black Dog Books reprint of a vintage pulp adventure yarn by H. Bedford-Jones. This one was originally published as a complete novel in the February 1920 issue of BLUE BOOK, one of the classiest of the pulps. Eric Venable is a minister who finds himself beset by tragedy and winds up a drug addict. That’s not a spoiler, because it’s the situation as the story opens. Venable loses his church and sinks far into the depths of degradation, only to wind up being shanghaied onto a tramp steamer bound for China. That proves to be his salvation, of course, because he’s forced to get over his opium habit and the hard work as part of the ship’s black gang builds up his body and returns his strength to him. That’s still just prologue to the main story, which finds Venable and the ship’s engineer who has befriended him signing on as part of the crew on a mysterious ship sailing from China back to America. What Venable and his friend Garrity don’t know until it’s too late is that the ship’s passengers are all Russians, a volatile mixture of aristocrats and Bolsheviks. Each group wants to kill the other and wind up with their hands on a fortune in gems and religious artifacts which were smuggled out of Russia by a group of nobles on the run from the Reds. And there’s intrigue going on among the groups, too, as double-crosses abound. Throw in storms at sea, a few gun battles, knife-wielding Chinamen, some far-fetched coincidences, and a little romance and you’ve got a fine example of a blood-and-thunder adventure yarn. Being decidedly old-fashioned (it was written nearly ninety years ago) and somewhat politically incorrect, it won’t be to everyone’s taste these days, of course, but I thoroughly enjoyed it. 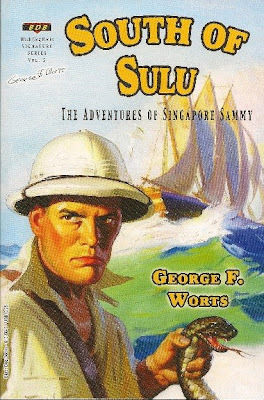 This is a very handsome trade paperback from Black Dog Books reprinting five of George F. Worts’ novelettes from the pulp SHORT STORIES starring Singapore Sammy, a brawny, redheaded adventurer whose real name is Samuel Larkin Shay. I’d read some of the later Singapore Sammy stories published in ARGOSY, but evidently the character got his start in SHORT STORIES. And these yarns are absolutely top-notch pulp adventure, too. In the stories, Sammy is roaming the tropics, mostly Malaysia and the South Pacific, searching for his ne’er-do-well father, who abandoned his family when Sammy was two years old. When Bill Shay left his wife and child, he took with him a will leaving a fortune to Sammy from his grandfather, and of course Sammy wants that will back, along with revenge on his father for deserting them. Naturally Sammy gets involved in all sorts of adventures while he’s looking for his father: stealing a blue fire pearl from an evil maharaja, crossing swords with a crooked gem merchant known as the Cobra, getting trapped in shark-infested waters, hunting down a rare pink elephant, and braving an attack by an octopus to recover some sunken treasure. Some of this is a little over-the-top – what else do you expect from pulp stories? – but Worts was such a good writer that he makes it all believable and keeps the pace racing along. These are fine examples of two-fisted South Seas adventure yarns, and I had a great time reading them. 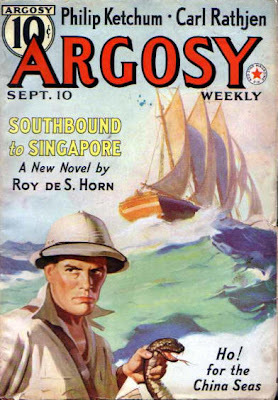 That excellent George Rozen cover, by the way, is actually from the September 10, 1938 issue of ARGOSY and has nothing to do with Singapore Sammy other than the fact that the lead story in that issue is entitled “Southbound to Singapore”. It’s by the prolific pulp editor and writer Roy deS. Horn rather than Worts. But who cares? It’s a heck of a cover and equally appropriate for this book.